A Hamas leader announced Wednesday that the militant group will boycott upcoming Palestinian presidential elections, the first sign of open tensions between the interim Palestinian leadership and the Islamic opposition group since the death of Yasser Arafat. Interim leader Mahmoud Abbas' presidential candidacy ran into another pothole a few hours later: Associates of jailed Palestinian uprising leader Marwan Barghouti said Wednesday that he has decided to run for president, reversing an earlier decision. The deadline for announcing a candidacy is midnight Wednesday. The announcement by Hamas leader Ismail Hanieh could undercut the legitimacy of the Jan. 9 election, though Hamas said it would honor the outcome. Hamas has tens of thousands of supporters and is particularly strong in the Gaza Strip. "We are not calling on the Palestinian people to boycott the election, but Hamas members will follow the decision to boycott the election," Hanieh said. Hanieh spoke as Egyptian and Israeli leaders met in Jerusalem to discuss Israel's planned withdrawal from Gaza next year. "We are hopeful that this visit will contribute to a better environment," said Egyptian foreign minister Ahmed Aboul Gheit after his meeting with Israeli Prime Minister Ariel Sharon. Israeli officials said the two sides agreed in principle to allow Egypt to deploy additional troops along its volatile border with Gaza to help ensure quiet after the pullout. Since Arafat's death, the rival Palestinian factions have maintained a fragile calm, pledging to maintain unity during the current transitional period. Barghouti's decision came after he met with his wife and two senior Palestinian officials at an Israeli prison where he is serving multiple life sentences, the associates said on condition of anonymity. Word of Barghouti's candidacy came just hours after interim Palestinian leader Mahmoud Abbas formally launched his campaign for Palestinian Authority president. According to recent polls, Barghouti is more popular than Abbas. Hamas is effectively saying that it does not recognize the moderate Palestinian leadership that hopes to revive peace talks with Israel, reports CBS News Correspondent Robert Berger. That gives Hamas the option of thwarting the peace process with suicide bombings and other attacks. Hanieh said his group would boycott the election because it did not include legislative and municipal elections as well. The interim Palestinian leader, Mahmoud Abbas, is a frontrunner in the presidential race, but Hamas would likely make a strong showing in local races. 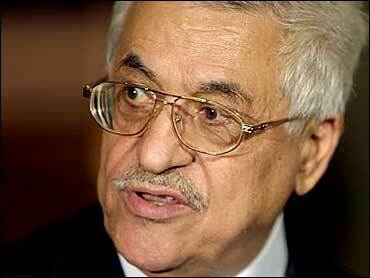 In the West Bank, Abbas played down Hamas' decision. "If they want to boycott these elections, it is up to them," he said. Formally launching his campaign, Abbas called for a renewal of peace talks with Israel and said the two sides would meet after the election. "We must have a dialogue with the Israelis," Abbas said at his campaign headquarters. "After the elections, we will meet again" to discuss the road map. The internationally backed peace plan calls for the establishment of an independent state next year, but has been stalled since it was signed in June 2003. Abbas suggested skipping over the road map's first stage of dismantling terrorist groups and begin talks immediately on the final stage of the plan, but Israeli Foreign Minister Silvan Shalom disagreed. "There can be no shortcuts in the process," Shalom said. The Palestinians have failed to meet their commitment to crack down on militant groups like Hamas, while Israel hasn't kept its pledge to halt settlement construction and pull down settlement outposts. Abbas indicated that he is ready to take action against the militants. "Every nation has opposition groups, but there are also laws and institutions," he said. "I am committed to having one authority and only one army and political pluralism." Hamas boycotted the first Palestinian general election in 1996 because it was a result of interim peace deals with Israel. Hamas opposes peace talks and is committed to Israel's destruction. With the road map stalled, Sharon has pushed forward with his plan to pull out of the Gaza Strip and four small enclaves in the West Bank. Sharon initially envisioned the moves as a unilateral act, arguing that he has no Palestinian partner. But since Arafat's death Nov. 11, Sharon has expressed willingness to coordinate the withdrawal with the new Palestinian leadership. However, Egypt remains an important mediator. On Wednesday, Egypt's foreign minister and intelligence chief met with Sharon and other Israeli leaders to discuss the pullout. Shalom said Israel had agreed to allow Egypt to deploy additional troops along the volatile Gaza border to help ensure calm after the pullout. The arrangement would require changes in the Israeli-Egyptian peace agreement, which limits the Egyptian military presence in the area. "We reached an agreement that allows for the deployment of additional Egyptian forces on the Egyptian side of the border, despite the fact that the peace agreements don't allow this," Shalom said after the meeting. Israel is interested in Egyptian help because it fears a Gaza withdrawal will leave a security vacuum. Gaza has been plagued by increasing chaos in recent months. Palestinian militants have also stepped up attacks on Israelis in the area in recent months to make it appear as if Israel is fleeing. Aboul Gheit offered Egypt's help in enabling the Palestinians to assume responsibility for the border area. "We are asking that we would be able to retrain, to strengthen their ability to project themselves on that area too," he said. Aboul Gheit and Sharon pledged to work to revive the road map. In the meantime, Sharon said he is ready to coordinate the Gaza pullout with the new Palestinian leadership. "It will be possible to coordinate with the new Palestinian leadership security matters and different aspects regarding the disengagement," he said. Sharon also pledged to help the Palestinian elections go smoothly and said he is considering "humanitarian" steps to improve conditions in the West Bank and Gaza.